Have you been following the Bible Brick Challenge from Proverbial Homemaker? It’s a wonderful way to help your kids learn about scripture! This month, it’s time to learn about stories from Exodus 32 to 1 Samuel! Each month in 2018, you’ll find a new challenge calendar of fun lessons and Lego activities. These are designed to help your students learn about the Bible in ways they can have fun with and really absorb! To get your free calendar, just go to Proverbial Homemaker! While you’re there, be sure to check out all the other fun ideas and resources. There are some great ones! 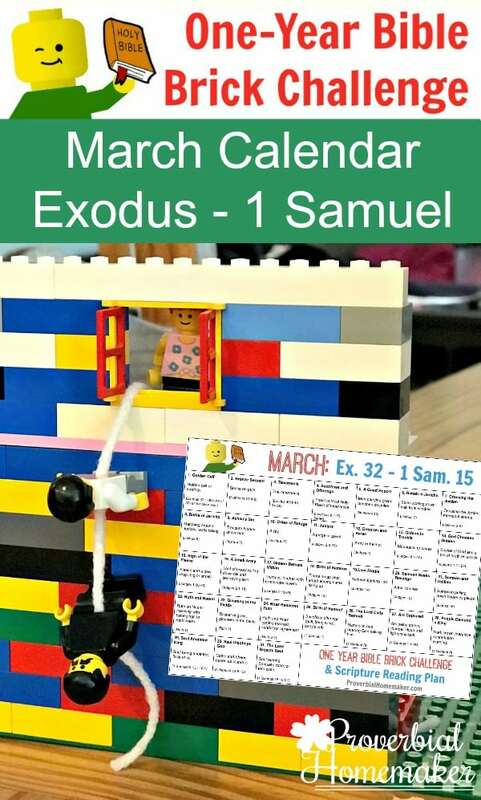 Download your free March Bible Brick Challenge Calendar!